Is D&D Doomed? Is 4E Better? Are You Playing It Wrong? All Questions Answered! I've been blogging in the old school arena for less than a year now, and it seems as if not a fortnight goes by without someone making a statement or query that stirs up a hornet's nest. Next thing you know, the philosophers start philosophizing and the trolls start flaming. Before long, many of the posts on the blogs in that long list to your right become less about playing and appreciating the games we love, and more about debating their merits and faults, and arguing over their possible ultimate fates. Well, it's time to put an end to this madness, I say. In desperation, I turned to the only reliable source I could think of to give us final answers to the questions that so frequently drive the old school blogoshpere into utter chaos: The Great and Wondrous Twenty-Sided Oracle of Matt-El. Is the RPG industry doomed as well?? Is 4E the greatest version of the game yet made? Am I playing the game wrong? Does it really matter if I'm playing it wrong? Should we just get over it and enjoy the game(s) already? A-ha! There, you see? It is working after all. Well, there you have it, straight from the horse's mouth: the irrefutable answers to the questions that have been dogging the old school blogosphere. You can thank me later. ROFL. Well, the Oracle has spoken on all important things. Preparing to move on now. "Of course, done with an old school icon - a random generator." Clarification: a d20-based random generator. Respect the icosahedron! Holy ... you're right. The Oracle, according to various sites, is indeed a icosahedron. The game system, in general only covers combat. 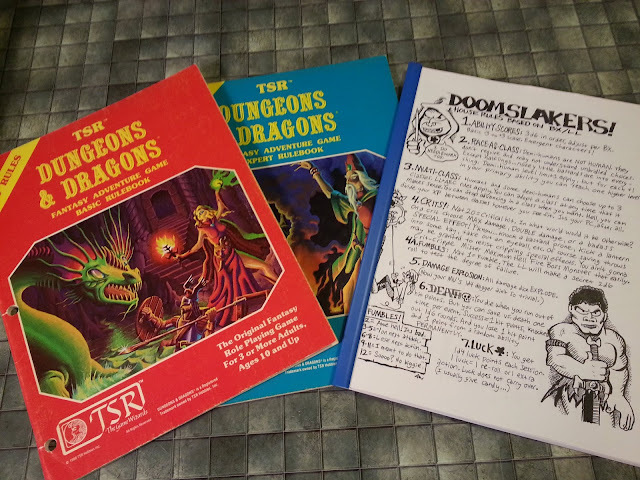 So, any version of D&D, GURPS, Call of Cthulhu, Palladium, will let you have the game you want. I like the guys/gals I play 4e with, and would probably like playing Parcheesi with them. --We need more crazies with senses of humour like you. I wonder if you could pry one of those things open and replace the oracle with a numbered twenty sider? 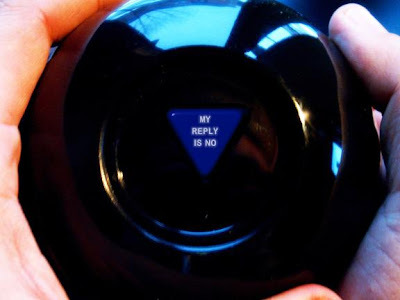 The players could never argue with the results of the magic eight-ball! Hah, that would be great palmer. Well, the Oracle has spoken, glad to see it's finally over and we can all move on now. @E.G.Palmer: I was thinking the same thing! And maybe have several Oracles, each with a different polyhedron in it - for damage and such. Wait.. wait... players with M8B's to do dice rolls? Man, I've seen dice fly across the table when tossed in disgust at a bad roll. The M8B being tossed would make that a dangerous event! I LOVE that last answer. Seems there has been rat too much discussion of philosophy in the OSR and not enough about having fun. And by the gods if I hear another argument about what "is" fun..and what "is" is..and what "what" is..I'm going to moon somebody. Yeah you heard me... right here on teh interwebs for the world and my own Mamma to see. I wouldn't want to use a M8b anyway. No way to "neem" the dice and bend my stat numbers to my will..